Digging in for some of the best developer blogs? Well you’ve landed exactly on the runway you should have! This entire post is just about that. It’s a common misconception that the best developers and programmers don’t share everything they know, especially for free. They do! Well that’s where this piece on the best developer blogs comes in to prove such concepts wrong. The owners and authors on these blogs aren’t only highly qualified, and internationally acclaimed, but also share million dollar research articles and materials absolutely free on their platforms. Not really a “developer blog” name, right? Well so aren’t “Apple” and “Nokia“, still they are leading giants on the planet. Catonmat is one of the best developer blogs on the planet and run by an equally talented guy, Peter Krumins. Peter holds a degree in physics as well and is a certified chess coach too! Why all this praise-singing for Peter? Well, because I believe any blog on the globe is only as effective and useful as the guy behind it, so you need to know it’s not a blog started by some wanna-be out of “nothing better to do” factor. Peter started his first online project back in 1999 selling music and movies online! (1999? I couldn’t imagine a “computer” back then!) Since then, he has launched more projects, startups and online assets I can possibly include in this list. But anyway his latest project is the launch of his own company, Browserling that lets you cross-browser test websites. So that was about Peter (or a fraction of it!) Let’s move on to what happens at Catonmat. Programming – Awk, Perl, Sed, Bash, UNIX, Python…. Hacking and computer security – Penetration Testing, Vulnerabilities…. Software development – Algorithms, code design and testing…. Google -Latest Google news and updates from programmer’s perspective…. And these are just the “Headlines”, chances are anything related to “Programming or Hacking” is most probably been penned down by Peter. So basically anything and everything that goes on the Internet is covered by Catonmat. I honestly won’t be able to do justice to all the hardwork and research Peter has put in the blog except if you check Catonmat out for yourselves. 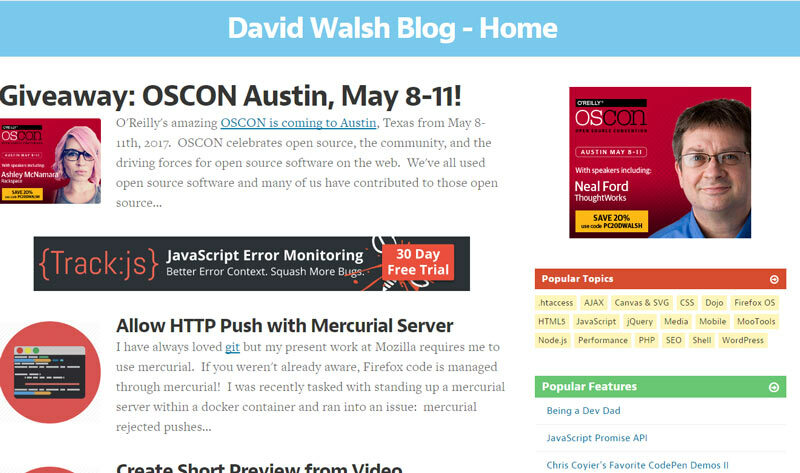 David Walsh is a well-known figure if you’ve seriously researched upon Software, Programming or Web designing in your lifetime. He is running the blog since 2007, so on the least he has a 10 year experience in the industry. Apart from that, he is a senior software engineer at Mozilla (Yeah, the top competitor for Google Chrome browser!) Before that he has contributed to BestBuy and other such platforms, so “talent” or “genius” isn’t the question here. Even the blog looks extremely neat and professional. The top bar has separate sections for “The blog”, “Tutorials”, “Demos” and so on. He even covers deep back-end web designing topics, including Servers, APIs, CSS and what not! Bottom-line is, David knows his game and you definitely should stumble upon his blog if you’re reading this piece right now! There are quite a few blogs who talk about Software, Security, and Programming and they are good platforms too. But there’s something that makes Coding Horror exceptional, unique, and something that can’t be copied! It’s the “Human Factor” Jeff includes along with his codes and algorithms. He makes a very special and logical connection between the “code” and the people/user/developers behind or in front of the code, and that connection is something you won’t find anywhere else. Jeff? Jeff Atwood? Not ringing a bell? Try this, Stack Overflow? Stack Exchange? Yeah, the co-founder of those globally leading forums. 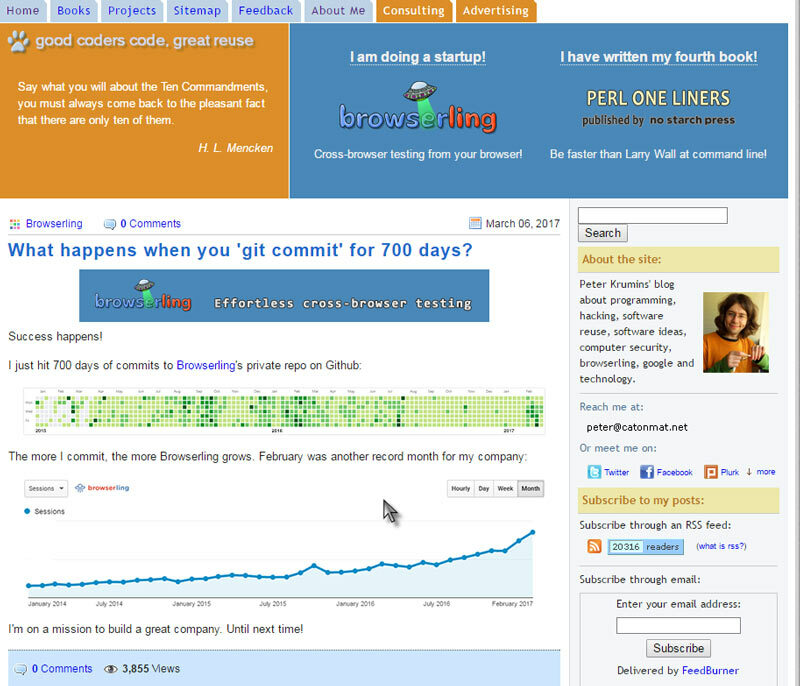 In fact, the name “Stack Overflow” too was chosen by readers from the Coding Horror via a poll! So anyway, Coding Horror is like the Bible for you if you’re here for Programming or Coding related topics. Not just that, having deep knowledge with Browsers and Search Engines, you can most definitely find SEO optimization tricks and tweaks over there as well. The name is self-explanatory. 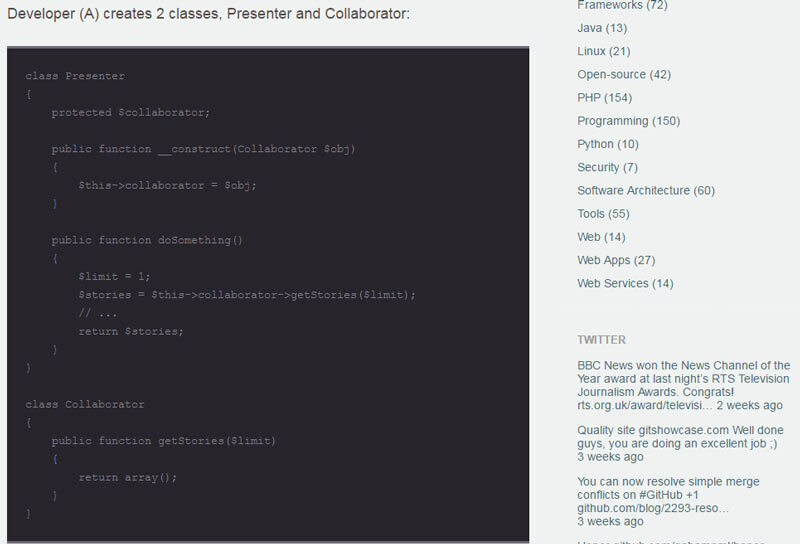 It’s a programming blog, made for everyone on the internet. To name just a few! It isn’t updated as frequently as Catonmat, but even then the articles and research available on this one doesn’t get outdated now, does it? Even if you randomly click on any blog post from MPB, you would still find that you’ve learned at least couple new terms if nothing else by the time you finish reading that piece. Andy is a platform that essentially verifies my statement that “The best things are often simple”. Not just Catonmat, but Coding Horror and even Andy are surprisingly simple. It’s ironic considering these are run by folks who literally half-invented the Internet. Andy has authored over 4 different books, on topics related to Software, Programming, Java and what not! Reading Andy’s blog feels much similar to reading a book. Simple black text printed on a white background. No images, ads or distractions. But these blog posts holds some of the deepest facts you’ll ever come across in the fields of Codes, or Programming. What Andy’s blog consists of isn’t something that can be explained in a paragraph as short as this. Basically anything and everything even remotely related to Programming is there on Andy and hence it’s in this list of the best developer blogs on the planet. The blog was registers back in the 1999! With nearly 17 years of age, I doubt if Andy has left any topic uncovered over there. Primarily focused on APIs, ProgrammableWeb is clearly one of the best developer blogs out there. The complete Menu bar is concentrated around API Research, API basics, what is an API and stuff mostly related to APIs. In fact, it’s a one of the largest API directories on the web. You can search for APIs for almost any web-platform using TPW’s API directory and it gets you what you’re looking for. They also have detailed, explanatory videos in addition to their blog posts to explain the articles better, backed up with “courses” on APIs, Open Data and other sides of Programming and development. Run by Max Kanat Alexander, a senior employee at Google and publisher of “Code Simplicity: The Science of Software Development”. As the name suggests, Max tries to “simplify” coding over at Code Simplicity. It’s more like a “Supplement” to his book, but it’s a great resource for programmers and developers anyway. No doubt you can find complex algorithms and solutions to you problems over there, but what you should primarily expect is a “psychological solution” and not mathematical ones. 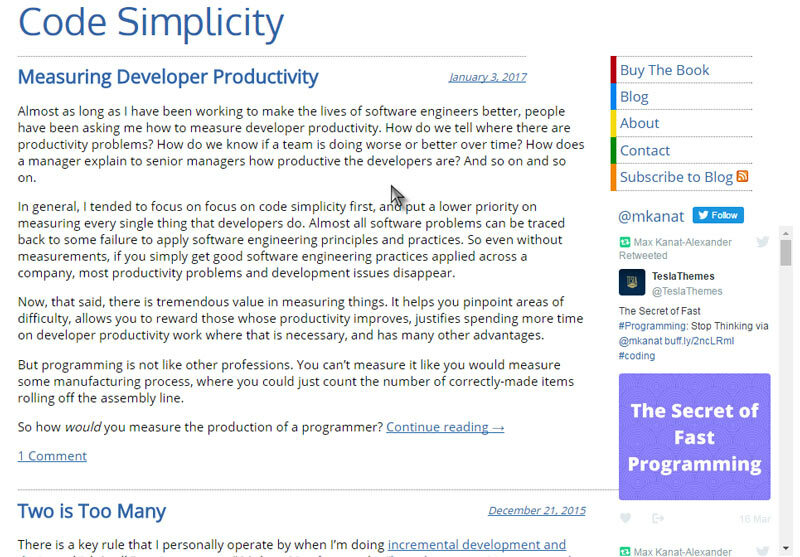 For ex: Some of his most popular blog posts are “The secret to fast programming”, “How to be more productive while coding” “Readability and naming things” etc. As is clear, he seriously simplifies coding. Here’s what Max believes: – “There’s just too much complex stuff in the world. Complex stuff can’t be used, and it breaks too easily.” Anyway scroll through the blog for yourselves if you need a deeper bite of what he thinks and researched articles on coding or programming. Web Resource Depot is exactly what the literal meaning of the name translates to. A depot of “Web Resources”. It’s a magazine style blog and covers most of the “Web” topics. Although an overview of the blog makes you feel as if it’s a blog focused on “Designing” and “Photoshop”, that’s not true. It has published some revolutionary pieces on xBug, has launched its own “DNS pinger” and other stuff as such. I agree it’s not as focused on “Programming” as Catonmat or even My Programming Blogs, but the pieces published there are enough to get it mentioned on this list of the best developer blogs. They are well researched, practically implemented and “innovative”, so they aren’t singing the same old song as every other blog and hence I’ve been a long time subscriber. If you’re looking for a “Web designing” platform, Web Resource Depot is your go-to platform! I needn’t say much, just head over to the blog and the logo speaks for itself! Jason Young is an employee at Microsoft, who speaks his mind out (literally) on his blog YTechie. Unlike most of the other best developer blogs on this list, Ytechie actually mixes humor with programming, and you won’t feel as if you’re talking to a robot or a very strict lecturer. Ytechie covers almost everything that there is to programing like most other blogs we’ve talked about so far, starting from C++, venturing through Java, Node.js it just knows no end. Also apart from strict “how-to” tutorials and complex algorithms, Jason has tried to “humanize” the blog with posts like “What a developer needs from his manager” and posts of that sort. A simple, WordPress powered blog over at blog.fedecarg.com, primarily focused on PHP and delivers complete tutorials with screenshots. The one thing you’ll love about Fedecarg is that he just doesn’t “theorize”, he writes the code for you, executes it and shows you the result before moving on to the next step. And a whole lot of other topics, it clearly is one of the best developer blogs out there. A total of over 200 blog posts, neatly categorized into different categorized can be found over at Fred’s. So that was it folks, the blogs on this list of the best developer blogs are more than enough to feed your appetite for programming and software solutions. Do let me know which platforms caught your attention and why! Also if I missed something worth being on this list, feel free to use the comment box.